A blog post on DesignSpark - an online community for electronic engineers - has described how the Raspberry Pi mini computer can be synchronised with NPL's atomic time scale via the MSF Radio Time Signal. The Raspberry Pi was released in early 2012 by a charitable foundation to encourage people, and especially children, to learn computer programing skills. To keep the costs as low as possible (retail price: $25) the system does not contain a real-time clock chip, which is found in most computers to keep the time. Andrew Back, the author of the blog post on DesignSpark, found that by linking the Raspberry Pi to a receiver module, which can pick up the MSF Radio Time Signal, the computer can be synchronised to the atomic time scale maintained at NPL. This setup, as well as providing a time source for the computer, could also potentially function as a radio-controlled Network Time Protocol (NTP) server, used to synchronise the clocks on a number of different devices connected to a network. 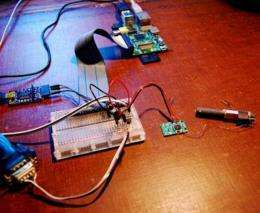 This is a good example of the type of projects being carried out using the Raspberry Pi, with programmers using their skills to test the limits of the computer's design and achieve solutions to real world problems. A quick look on the official Raspberry Pi forum gives some idea of the envisaged applications, ranging from robotics and home security to managing weather balloon data and GPS devices.